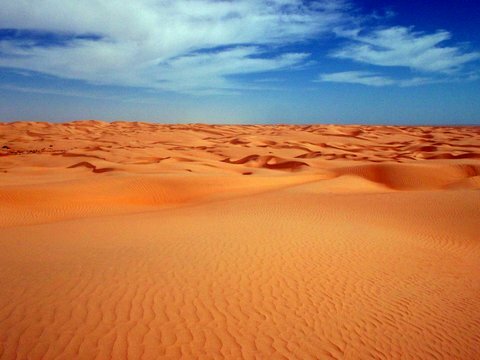 Nothing but sand – everywhere you look and everywhere you feel! There is not an inch of my body that is not covered in the fine powder or one part of our 4WD that does not resemble a sandbox. Fortunately, my Omani friend and I knew what we were getting ourselves into as we head off from Muscat on a Wednesday afternoon in a 3.8l Mitsubishi Pajero. 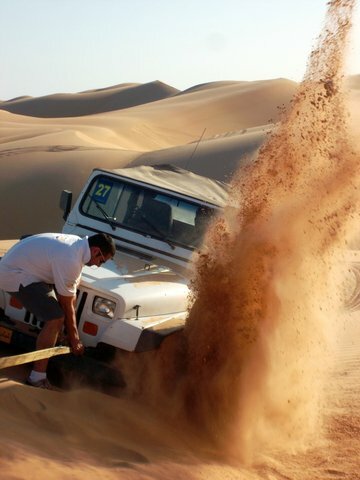 His car has been especially equipped with steel bumpers that cannot break and an electric winch that can easily pull out anyone who gets stuck in the soft dunes. 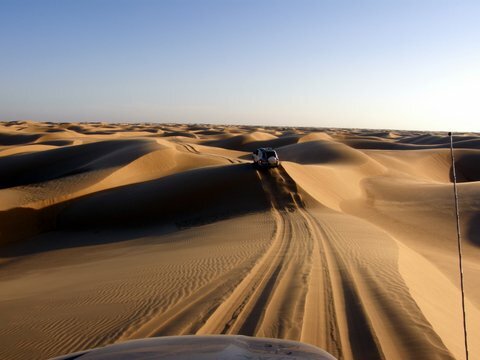 Our destination for the first night of this weekend crossing is Badiyah, one of the entry points into the Wahiba Sands also known as the Sharqiya Desert. 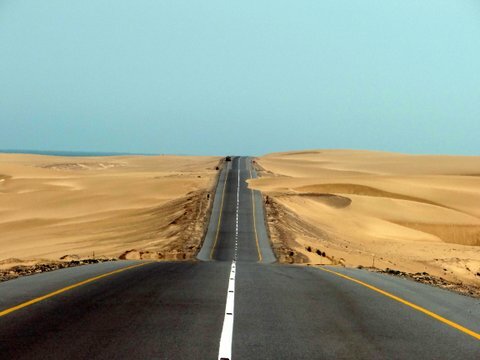 A mere three-hour drive from the capital, 12,500 square kilometers of sand await anyone who dares to enter. We are only two passengers but the back of our car is full with gear for three days of driving and two nights of camping: Jerry cans with extra fuel, various tools, a coolbox filled with ice and drinks, tents, mats, sleeping bags, water containers, our bags and cameras. However, we are not the only ones headed for the big adventure playground. At the meeting point at Al Raha Camp there are about 75 4WDs. The place is buzzing with drivers comparing cars and chatting about the challenges that lie ahead. Due to the summer heat, there had been a five-month desertbreak and everyone out here now is keen to get back into the dunes. 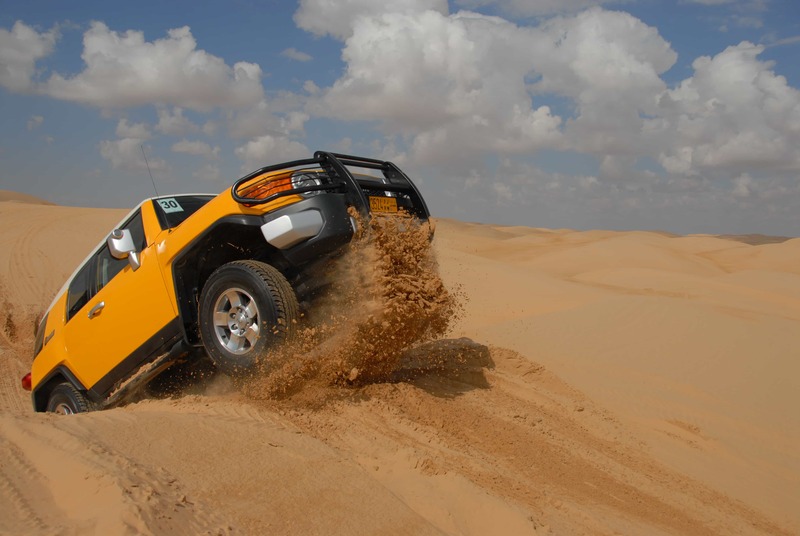 The adventure travel company “The Guide Oman” organized this expedition. The team registers everyone and hands out walkie-talkies, as there is no cellphone reception in the desert. The kitchen crew will disappoint anyone who thought they might shed a few pounds this weekend. For every meal they set up a mouth-watering buffet consisting of shuwa, curries, dhal, fish, meats, cooked vegetables, salads and fresh fruit. A team of sweepers also makes sure no one gets left behind in the dunes and for those who prefer a WC to nature, there is even a toilet truck. The participants are a mix of expats, tourists and to a large extent Omanis. It’s especially the locals who bring their modified 4x4s and one can only guess the amount of money they have put into their desert toys. Some of the Omanis belong to the upper end of society, but in the desert everyone is equal and lends a helping hand. All men have replaced their traditional dishdashas with the more practical shorts and t-shirts. After deflating the tires the group sets off into the night covering the first 80 kilometers to the campsite under the stars. It is almost full moon but you can only see as far as your headlights shine and the dust kicked up by the cars in front of you. By the time we reach, it is almost midnight. The campsite is the open desert, so everyone can set up their home for the night anywhere they choose. Some opt to be closer to the kitchen and the action, others who seek more privacy will find a spot a bit further away. The camp never really settles down as some continue to drink and make music and there are latecomers arriving throughout the night. It’s not until the next morning at breakfast that you see where you are and get to meet all the members of the desert family. After a briefing by the leader and some advice for first timers on how to drive in the soft sand, the real adventure starts. An unimaginable force, similar to taking off in an airplane, pushes me into the back of my seat. Above me I can see nothing but blue sky. Adrenalin is pumping through my veins, as neither I nor my copilot can see where the track continues. For all we know, there might be a steep descent on the other side of the dune or a deep ditch or just a narrow rim. The powerful engine is howling and sand is spraying in all directions. Only when the front tires regain contact with the ground, do I have a split second to react and bring the car back under my control while continuing to accelerate in order to avoid sinking into the soft sand and getting stuck. Soon the rescue teams have got their hands full digging the heavy 4WDs out of the sand. 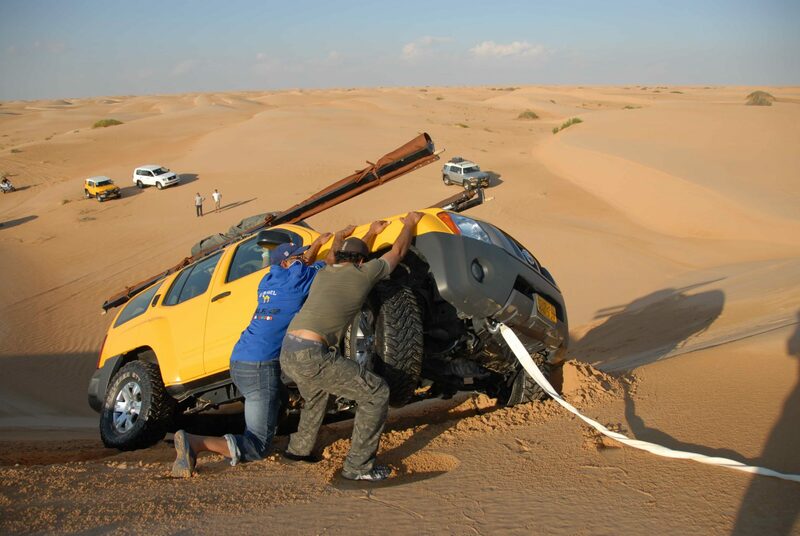 A few men hasten to prevent a yellow car from flipping and rolling down the dune by tying it to another car with a towrope. Anyone will help to pull out cars, change tires that have burst or come off the rim, or fix anything from exhausts to clutches to wires. Overcoming these challenges is part of the fun, even though the sun is starting to beat down mercilessly and the sand is getting so hot, that you need to wear shoes or thick socks to protect yourself. 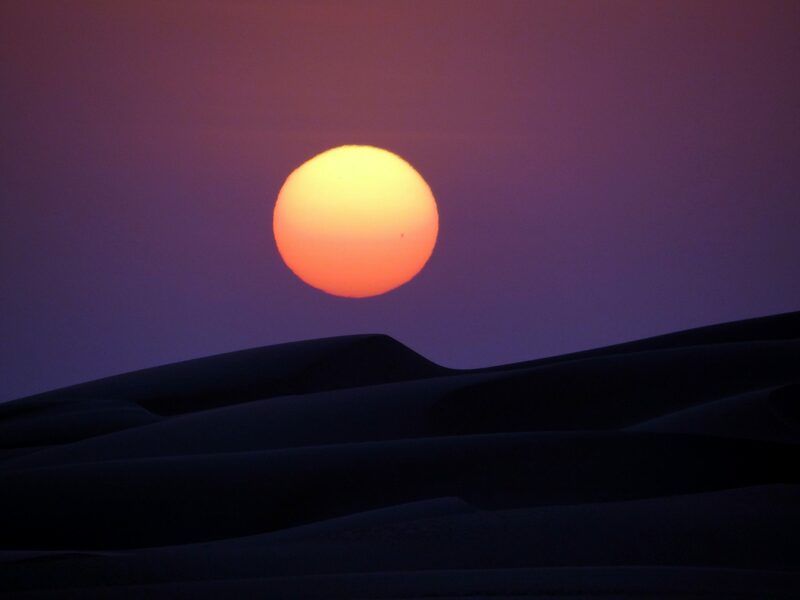 The landscape is ever-changing, from desert highway in the beginning to soft and high dunes. You never know what lies beyond the next mountain of sand, you only follow the tracks of the car in front, knowing that in an hour’s time they will have disappeared without a trace as the wind swirls the sand and erases all evidence. 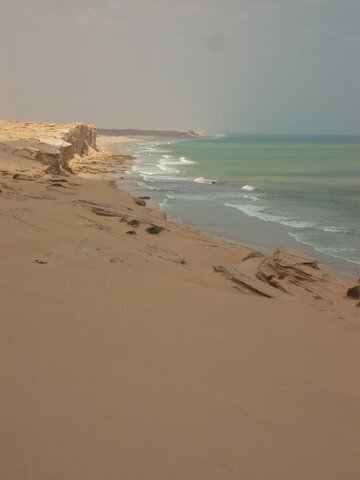 By the time we reach Ras al Ruiz the desert will turn into beach and the coast will be lined with sand cliffs. Around lunchtime we take a break from driving and digging. While the tired drivers desperately seek refuge from the sun under tarps that they fix between cars, the kitchen crew is busy preparing and setting up lunch. But for some it is too hot to eat anything but fresh fruits or salad. Fortified, we resume driving until sunset and then settle down for our second and last night of camping. 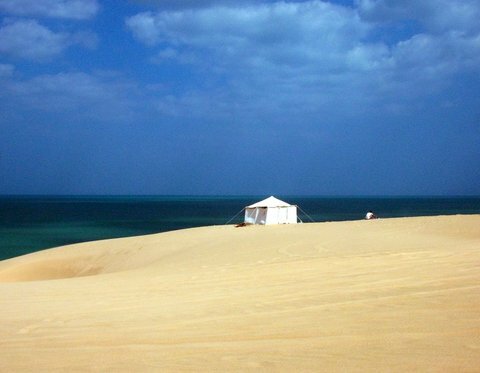 Careful to avoid camping too close to any bushes or patches of grass, where snakes, scorpions and all sorts of creepy crawlies might have chosen to hide, my friend and I set up our tents on a high dune just above the kitchen. I step away from the hustle and bustle and soak in the stunning view of the stars, the tranquility, the peace. It takes just a few steps of stumbling over the uneven ground and all sounds are swallowed up by darkness. I feel completely removed from everything: The city, stress, work, civilization. A real break from everyday madness. The next morning I wake up early. I peer out of my tent and can barely make out our car that is parked next to us. The early morning mist is so thick, that I feel like I am the only person out here. But it doesn’t take long for the sun to break through and the group to gather around the buffet. By 9am everyone is packed and ready to go. A few more hours of dunebashing lie ahead before we reach the Arabian Sea and can cool off in the clear water. This will feel like bliss. What a refreshing way to end the crossing before we head back to Muscat on the now rather boring tarmac. Alhumdulilah, no one got injured on this tour, except for a young man who got stung by a scorpion and had to be taken to hospital. However, some cars were not quite as lucky. Torn clutches, burst tires, scratches and dents, cracked bumpers and broken radiators are just some of the common breakages. And yet, these patients will return for another round of fun and adventure as soon as they have been patched up. If you’re a German speaker and would like to read more about my desert adventures and life in Oman, please take a look at my ebook “Zwischen Bikini und Abaya – Erlebnisse aus 3 Jahren Oman”. Includes some wonderful desert images. Traveling Alone as a Woman – You can do it!